If you’re familiar with the novel and film Fight Club, you’ll know the drill. A group of guys get together and encourage one another through tough love, and the next thing you know they’ve organized their collective efforts into a project designed to change the world. Okay, so that’s a fairly skewed interpretation of the film, but viewed through that lens, you can see how the Lowcountry F3 is sort of like Fight Club. Only instead of bare-knuckle brawling, it’s a series of workouts and strenuous exercises designed to get members feeling their best. And instead of Project Mayhem, this Fit Club is pooling efforts to raise money for a slew of local charities. 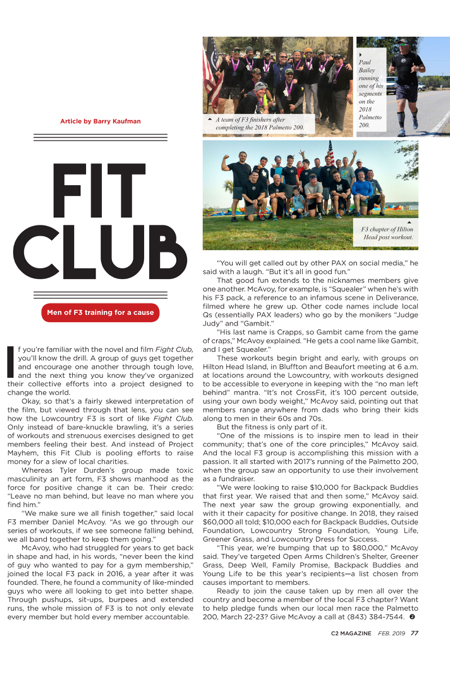 McAvoy, who had struggled for years to get back in shape and had, in his words, “never been the kind of guy who wanted to pay for a gym membership,” joined the local F3 pack in 2016, a year after it was founded. There, he found a community of like-minded guys who were all looking to get into better shape. Through pushups, sit-ups, burpees and extended runs, the whole mission of F3 is to not only elevate every member but hold every member accountable. These workouts begin bright and early, with groups on Hilton Head Island, in Bluffton and Beaufort meeting at 6 a.m. at locations around the Lowcountry, with workouts designed to be accessible to everyone in keeping with the “no man left behind” mantra. “It’s not CrossFit, it’s 100 percent outside, using your own body weight,” McAvoy said, pointing out that members range anywhere from dads who bring their kids along to men in their 60s and 70s. But the fitness is only part of it. “One of the missions is to inspire men to lead in their community; that’s one of the core principles,” McAvoy said. And the local F3 group is accomplishing this mission with a passion. It all started with 2017’s running of the Palmetto 200, when the group saw an opportunity to use their involvement as a fundraiser. “We were looking to raise $10,000 for Backpack Buddies that first year. We raised that and then some,” McAvoy said. The next year saw the group growing exponentially, and with it their capacity for positive change. In 2018, they raised $60,000 all told; $10,000 each for Backpack Buddies, Outside Foundation, Lowcountry Strong Foundation, Young Life, Greener Grass, and Lowcountry Dress for Success. “This year, we’re bumping that up to $80,000,” McAvoy said. They’ve targeted Open Arms Children’s Shelter, Greener Grass, Deep Well, Family Promise, Backpack Buddies and Young Life to be this year’s recipients—a list chosen from causes important to members. Ready to join the cause taken up by men all over the country and become a member of the local F3 chapter? Want to help pledge funds when our local men race the Palmetto 200, March 22-23? Give McAvoy a call at (843) 384-7544. Should Children Have Laptops in Class?